Cooper Molera Adobe is located in downtown Monterey, California. 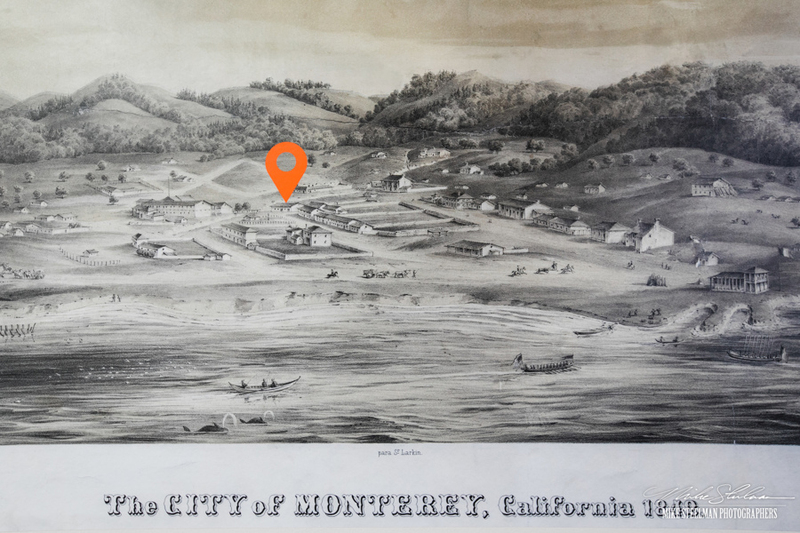 This remarkable place represents the layered history of the families who lived in and built Monterey, from its early years as the political and commercial capital of Mexican Alta, California, through the development of the State of California. Later, it became known as the center of a region known for both agricultural innovation and historic preservation. The site includes two adjacent adobe homes, a corner store, an adobe warehouse, and a barn complex, all on roughly 2.5 acres surrounded by a historic adobe wall. The principal adobe residence dates to 1827. Other portions of the property were developed across the 19th and early 20th centuries for a variety of commercial and residential uses. Donated to the National Trust in 1972, Cooper Molera was operated by California State Parks as a museum property under a long-term lease until December 2016. However, diminishing state resources resulted in substantially reduced operations at the site in recent years. Significant restoration needs—in particular, seismic stabilization of the historic barn complex—went unfunded. As a result, Cooper Molera had the appearance of a shuttered historic site for many passers-by. Only a small museum shop run by local volunteers of the Monterey State Historic Park Association was in regular operation. With no endowment, no state lease, and no sustainable sources of funding for operations and rehabilitation needs, the National Trust recognized the future of Cooper-Molera to be precarious—a situation common to many house museums and historic sites. Cooper-Molera is significant as the original home of John Bautista Rogers Cooper, an American sea captain who settled in Monterey during Mexican rule in the early 20th Century. Cooper became a successful merchant, and acquired extensive landholdings throughout Northern California. His wife, Encarnación Vallejo Cooper, was the sister of General Mariano Vallejo, who played an important role in California’s transition from Mexican rule to an American territory. Subsequent generations of the Cooper family made significant contributions to the development of agriculture in the Salinas Valley. Cooper-Molera showcases residential life in early Monterey, when the small port city was the social, economic, and political hub of California in the era prior to the Gold Rush. The site is a contributing resource within the Monterey Old Town National Historic Landmark District. After extensive engagement with local stakeholders, the National Trust developed a concept designed to bring new life to Cooper Molera: a “shared use” model for the property that includes an active program of historic interpretation by the National Trust centered in the Cooper and Diaz Adobes, along with compatible commercial uses appropriate to the historic setting. This is a particularly appropriate model for Cooper Molera, since the site had an active combination of commercial and residential uses for most of its history. While the idea of integrating commercial and nonprofit uses at a historic site is not a new concept, “shared use” reflects the active interpretation of the site’s history. Commercial operators can create distinct businesses, for-profit and nonprofit entities can manage the site collaboratively, and commercial operations can create new revenue streams to support preservation and museum activities throughout the site. Seismic reinforcement and historic rehabilitation of the Cooper Molera barn complex to allow future use of the barns as an event center.Over the years, the Cooper-Molera barns have been used for a variety of functions, from weddings to folk dances. These buildings, however, have long been closed to the public due to seismic instability. The National Trust and its project partners, Foothill Partners Inc. and Events by Classic, will undertake significant seismic retrofitting and add a catering kitchen to help bring these beautiful redwood barns back to life. Refurbishment of the Corner Store as a bakery and cafe. Early in the 20th century, the Corner Store served as the Pioneer Bakery. Bringing history back to life, the Corner Store will again become a bakery and cafe with additional seating in the adjacent Cooper Molera courtyard. The Corner Store addition, a structure built in the 1980s by California State Parks, will be demolished and replaced with a compatible building of similar size to house the bakery kitchen and modern bathrooms for the entire Cooper Molera complex. Continued educational and interpretive uses in the Adobes and throughout the complex.The National Trust will take over operation of the historic adobe museum properties and is working closely with its commercial partners to ensure that the stories and history of this important historic site are not simply confined to its “museum” or adobe structures. Instead, the National Trust plans to present the properties’ history throughout the site, including its commercial operations and shared use of the gardens and grounds. The National Trust will continue to participate in local traditions such as Christmas in the Adobes and July 4th Living History. It will also continue programming for school-aged children both in the adobes and on the grounds, including the “learning garden” adjacent to the Cooper Adobe. With more people visiting the site to enjoy its related commercial activities, the Adobes’ opportunities for “experiential” historic interpretation are significant.